Shirisha Shashank recently gave a Bharatanatyam performance at the Sri Siva Vishnu Temple in Lanham, Maryland, as a fundraiser for the victims of Hurricane Katrina. Shirisha, the wife of the young and talented Carnatic flautist, Shashank, is a disciple of Bangalore-based gurus Shyamala Murali, Radha Sridhar and Narmada and is also currently undergoing training from the acclaimed dancer, Priyadarshini Govind. Shirisha commenced the recital with a brief pushpanjali set to Ragam Hamsadhwani and Talam Adi. This was followed by "Ananda Nartana Ganapati" in Ragam Natai and Talam Adi. Sung by Jahnavi Jayaprakash, the item used nrtta to describe Lord Ganesha. The choreography was interesting and well danced by Shirisha. Her face was bright and her expressions controlled. Next came a varnam in Ragam Shriranjani and Talam Adi. The varnam, "Saami Nee Manamirangi," tells the story of a sakhi of the nayika who goes to Lord Muruga and tells him of the pain and agony that the nayika is feeling being away from her Lord and the sakhi asks the Lord to go to the nayika. This famous varnam is a composition of Papanasam Sivam and choreography by Rukmini Devi Arundale. The interesting jathi penned with the words "Om Sharvana Bhava" was set by the mrudangist Vijayaraghavan. The nrtta aspects of the varnam were well done, with crisp execution of the adavus. The abhinaya was restrained and subtle. Perhaps a bit more emoting would have added more depth to the performance. The pain and agony that the nayika feels at being separated from her Lord needs to be better conveyed to the audience. 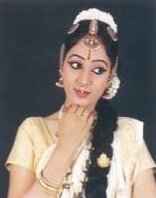 After a short break, the dancer returned draped in a white shawl to dance to "Chittike Vesike" set to Ragam Kalyani and Talam Adi. Lord Krishna challenges a gopi who persists in refusing his advances. The Lord becomes angry and criticizes her and asks if she thinks of herself as so worthy and beautiful that all men would come fall at her feet. Although the abhinaya was more effectively conveyed in this piece, the expression still felt a bit too restrained. "Jagadoddhaarana," composed by Purandara Dasa and set to Ragam Kaapi and Talam Adi, depicts the might of Lord Vishnu in the baby Krishna. Yashoda is awestruck to see the three worlds in her child's mouth. This piece was Shirisha's strongest in terms of abhinaya. Shirisha sparkled during the scenes depicting Yashoda playing games with her child. She successfully depicted the fun that a mother and child have together. Shirisha concluded the recital with a short thillana composed by Dr. Balamurali Krishna in Ragam Brundavani and Talam Adi. She executed her steps with precision and danced with a smiling face. Perhaps due to the lack of adequate lighting, Shirisha generally stayed in the back-half of the stage and only occasionally ventured to the front of the stage. Her recital would have had more of an impact if she had spent more time dancing towards the front of the stage. Also, perhaps it's a sign of the times but more effort needs to be put into dancing in Araimandi. The recital was not entirely consistent with regard to this aspect. With such crisp execution of the footwork, consistent use of Araimandi would elevate Shirisha to another level. Aneal Krishnamurthy is an admirer of the classical Indian dance forms. Although a lawyer by profession, he has been deeply interested in promoting the classical Indian arts in the United States. Through his critical writings, he hopes to share his thoughts on the current state of classical Indian dance as well as the future direction the dance forms may take.